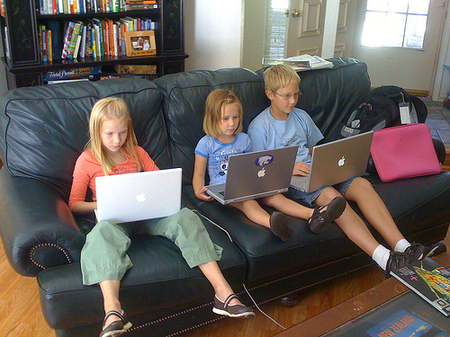 A milestone was passed today as Forrester revealed that Americans now spend more time on the internet than watching TV. I’ve always been an internet-over-TV girl, but it’s significant that that’s now the norm. It’s not that TV use has fallen back, more that internet use has shot up by 121% in five years. Now Americans spend an average of 13 hours a week on each activity. It’s going to be Youtube not MTV or the Disney Channel that will the background for the childhood of kids born in the 00s..
Of course, this distinction will start to fade as internet becomes available on the TV and soon screen content will become indistinguishable.